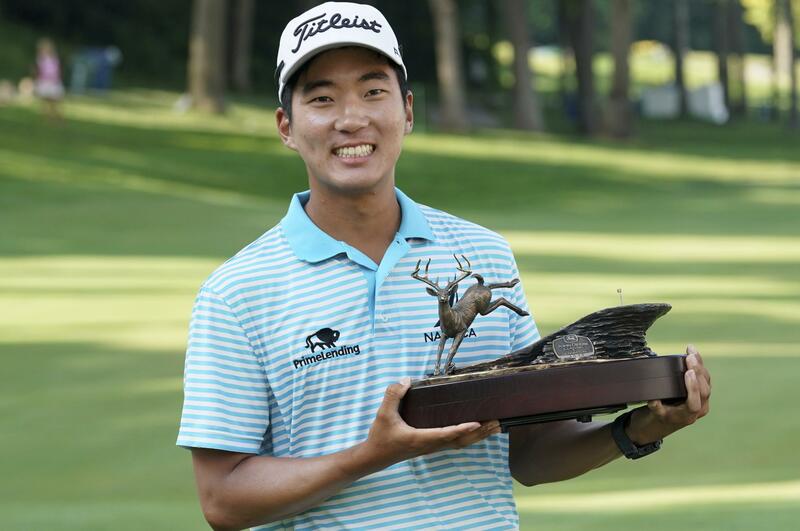 Sun., July 15, 2018, 8:13 p.m.
SILVIS, Ill. – Michael Kim didn’t just win his first PGA Tour event on Sunday. He dominated in a fashion never seen at TPC Deere Run. Kim’s dominance overshadowed a breakout tournament by Clarkston High product Joel Dahmen, who tied for second place 19 under. Kim’s prizes? A little over a million bucks, a two-year exemption on tour and a trip to the British Open. Kim shot a final-round 66 on Sunday to win the John Deere Classic by a record-setting eight strokes. Kim, who turned 25 on Saturday, finished at 27-under 257 to break Steve Stricker’s tournament record from 2010 by one shot. Kim also qualified for next week’s Open at Carnoustie, taking the only qualifying spot held for the John Deere Classic. Kim also made 30 birdies for the week, a season high on tour in 2018. Dahmen, Bronson Burgoon, Francesco Molinari, and Sam Ryder all finished at 19 under. Kim took all the drama out of the final round with birdies on his first three holes and secured the largest margin of victory during the tournament’s stay at the course, which began in 2000. J.P. Hayes (2002) and Vijay Singh (2003) won the event by four strokes. Kim, who had previously had just one top-10 finish in 84 career starts – a third at the Safeway Open two years ago – entered play with a five-shot lead. It was the biggest edge for a third-round leader at the John Deere Classic since Stricker’s six-stroke advantage eight years ago. Published: July 15, 2018, 8:13 p.m.